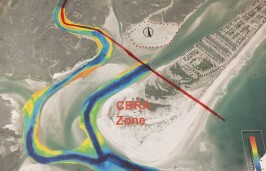 This map from the Carteret County Shoreline Protection Office shows the three reaches making up phase 1 of the Post-Florence Renourishment Project. EMERALD ISLE – Weather and sea conditions last week forced work to pause, but the Post-Florence Renourishment Project for Bogue Banks is well underway, the Carteret County Shore Protection Office announced Monday. Phase 1 of the project, which includes part of Emerald Isle, Indian Beach and Salter Path, is expected to use 945,446 cubic yards of sand from the offshore dredged material disposal site associated with the Morehead City Federal Navigation Project. 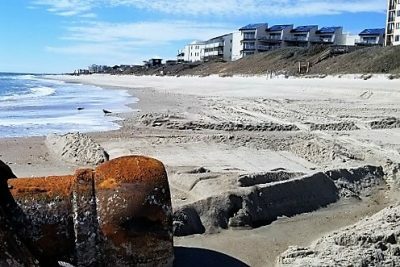 Emerald Isle is to receive 617,131 cubic yards, Indian Beach 617,131 cubic yards and the unincorporated area of Salter Path 56,410 cubic yards along the 5.2 miles of shoreline in three areas, or reaches, according to the shore protection website. Work was completed March 17 on Indian Beach and Salter Path, or Reach 3, where the project began March 8, and the first load of sand was delivered March 18 to Reach 2 in Indian Beach. Temporary pipes have been put in place on the beaches as part of the project, the first of which was in Indian Beach in February. 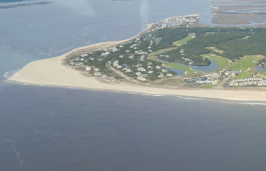 County Shore Protection Manager Greg “Rudi” Rudolph told Coastal Review Online last week the project should be in Emerald Isle, or Reach 1, about April 1, the final leg of Phase 1. Rudolph shared details about the project in late February with the Emerald Isle Business Association in the town board of commissioners’ meeting room. “The first phase of the project is $20 million. This is a big deal,” Rudolph told the crowd of almost three dozen. “We have until April 30 to do the project,” he added, explaining that the timeline for renourishment projects is based on when turtles are nesting and in the water. Rudolph joined a panel of speakers to answer questions about Hurricane Florence recovery and what to expect for the tourism season, especially regarding beach renourishment and the status of rental property, hotels and condos, in Emerald Isle. Rudolph explained that the plan with the Bogue Banks renourishment project taking place now is to repair the half of the dune that was carved out by the storm and create a flat spot, or “towel space,” he said. Rudolph said that his staff monitors the beach every May or June before hurricane season and again after hurricanes hit and knows how much sand is lost. An application is in for Federal Emergency Management Agency reimbursement, but “fortunately, one-half of the county’s occupancy tax goes toward the sole purpose of nourishment,” Rudolph said. Carteret County hotels, motels and short-term rentals collect a 6 percent tax that is used to fund beach renourishment and tourism marketing for the county. Collections totaled nearly $7.6 million for the year ended June 30, 2018, according to the Carteret County Finance Office. After the renourishment projects were finished in the 2000s, the fund was allowed to grow. “After Florence hit, we had the data, we had the permit, we had the money in hand. Within a couple months, we had a nourishment contract. We didn’t have to take out a loan, we didn’t have to do any of that,” Rudolph added. The bid for the contract is from Illinois-based Great Lakes Dredging. The dredge Liberty Island arrived in Morehead City Harbor from Charleston, South Carolina, the morning of March 8 and began work on Phase 1, which includes what Rudolph called the “dog leg,” through the eastern end of Emerald Isle, Indian Beach and Salter Path. Phase 2, planned for next winter, will be the remainder of Emerald Isle, Pine Knoll Shores and possibly part of Atlantic Beach, according to the website. Rudolph said part of the dredging contract is to plant sea oats and bitter panicum on the dunes as part of the second phase next year. 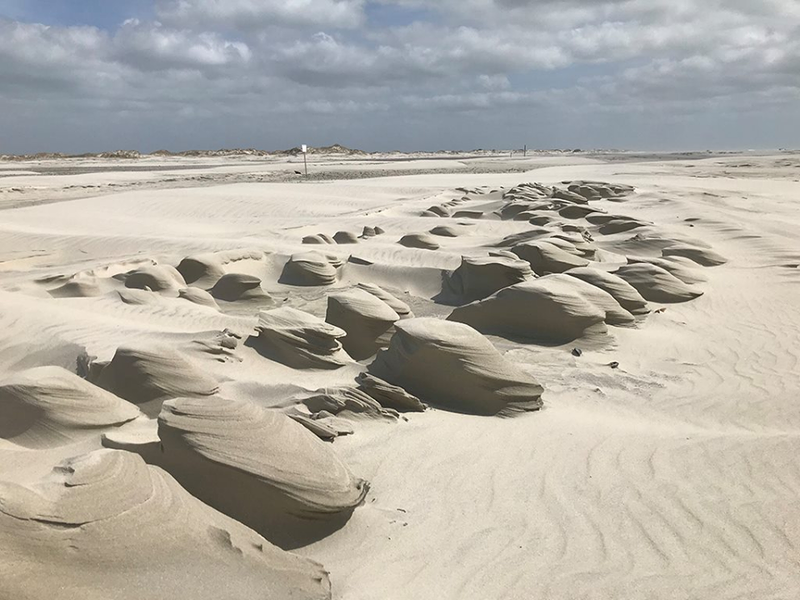 For individual oceanfront property owners looking to plant or install a sand fence to renourish their dune, Rudolph gave the go-ahead, but with the caveat the effort may be damaged at some point during the planned renourishment project. The nourishment schedule will affect rebuilding public beach accesses before the busy season. 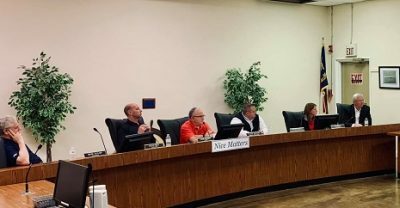 Alesia Sanderson, director of the town’s Parks and Recreation, who attended the meeting, said that all but 12 walkways in town had undergone annual inspections and were brought up to standard. She said that the eastern end of the beach was most damaged during the hurricane, leaving many of the walkways broken at the crest of the dune and some just hanging with sometimes a 20-foot drop. With the renourishment project wrapping up by April 30, there’s “a real time constraint on us for a couple of reasons. It’s going to be difficult to find someone to build 12 walkways between April 30 and the beginning of our peak season, Memorial Day, and that’s if we find available contractors willing to submit competitive bids,” Sanderson said. While it won’t be ideal because it will be more difficult to pull a wagon or push a beach cart, the accesses “will not hinder any of those visitors in the houses that are not oceanfront, they’re still going to be able to access the beach as they normally would,” Sanderson said. In addition to Rudolph, the panel included Emergency Management Coordinator Jenn Sawyer, who is also the planner for Carteret County Emergency Services; Emerald Isle Police Chief Tony Reese; Emerald Isle Mayor Eddie Barber; Woody Warren, Bluewater Vacation Rentals and Sales owner; and Jim Browder, executive director of Crystal Coast Tourism Development Authority. He said that the home rental situation is much better than that of condominiums and townhomes. Officials were worried that condominiums would not be repaired in time, but Warren said several Emerald Isle condominium units were expected to be ready by June. As for home purchases, Warren said that in September he would have predicted there would have been a fallout with a lot of contracts, but 2018 ended up being a good year. “2019 has started out a little bit slower … maybe the houses that are being built or getting repaired will be ready by the spring,” he said. Browder said stores and restaurants here should plan for a longer season. “This particular storm was a lot different than some of the more recent-history storms we’ve had,” said Sawyer with county emergency services when reflecting on the county’s response. She said that in typical storms, the worst damage is limited to specific areas, but Hurricane Florence affected the entire county. 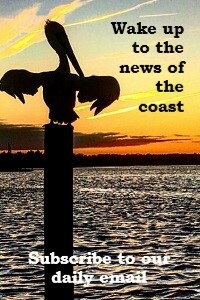 “Carteret County is unique compared to other counties across the state. We’re extremely long, were almost 100 miles of coastline, so there are challenges there and … the impacts were countywide,” she explained, including to infrastructure and accessibility. “There were a lot of moving pieces, it was dynamic, and it was challenging for the fact that most of us have not seen a storm of this magnitude in recent history,” Sawyer said. Town officials have discussed building a public safety center, Reese told the group. “What we’re looking at now is the possibility in the future of designing a building that would house public safety and permit us to keep our operation center here on the island,” the police chief said. Reese said the focus for police immediately after the storm was to assess damage and identify safety concerns. That work began before the hurricane had completely passed, and during the storm, teams began removing trees from roadways and trying to get the town ready to be reopened to the public. Reese explained that Bogue Banks mayors decide when to reopen the island. “It doesn’t do us any good to open up Emerald Isle if Indian Beach and Pine Knoll Shores are not going to allow people in their town, now we’re backing up cars down the highway and that’s just not a good thing,” he said. The police chief said one of the reasons the town weathered the storm so well was its evacuation response. 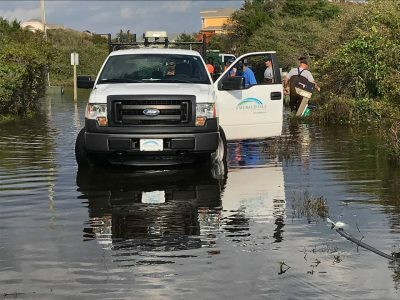 “The fact that we were able to get somewhere between 80 and 90 percent of the folks off this island freed up the town emergency services to focus on dealing with the storm rather than having to run rescues for those who decided to remain in town, or were stuck because of flooding or tree on their house,” he said. Warren agreed because, with access cut off to the island, vacationers who couldn’t use their short-term rentals could then collect on travel insurance. Reese added that the police department must enforce the curfew. “When we see someone on your property, it takes an officer off the street to figure out what’s going on,” He said. “Don’t be scared to call me and we will work with you to get you where you can leave your property safely … “We want to work with you, give you all the time you can, just need to communicate with us,” he said. In addition to being prepared for debris removal, the town was proactive months before the storm by signing a contract for pumps to alleviate street flooding, Barber said. The town had pumps secured months before the storm, but they didn’t expect there would be 31 inches of rain, Barber added. Additional pumps were secured but with the road closures between Emerald Isle and Wilmington, the pumps didn’t get to the town as quickly as needed. Following the meeting, Barlow told Coastal Review Online that the overall feedback from the meeting was positive.